A crowd has gathered on the streets of Norman. Maybe it’s the Norman Music Festival or the 2nd Friday Art Circuit. Everyone is enjoying the music, art, and food. But then the sound of approaching drums heralds a more unorthodox entertainment. A wildly costumed group of clowns, jugglers, unicyclists, fire-twirlers, hula-hoopers, stilt-walkers, and dancers appears. Has the circus come to town? No, this circus is native. The PFC, variously known as the Prairie Fire Circus, the Prairie Folk Circus, the Polar Fowl Collective, the Pee F Cee, and many more, is a 40 member improvisational street performance troupe based in Norman. “But definitely attention,” said juggler Steven Spallone. Robertson said the PFC was a unique addition to Norman entertainment. “There’s been a lot of attempts at community theater over the years, but I’ve never heard of somebody trying to attempt something quite like this,” she said. The PFC wants to expand people’s views of Okie art. They have performed in the Oklahoma City Ghouls Gone Wild and the Norman Mardi Gras Parade. They most recently performed in the 2nd Friday Art Walk, in which they plan to be regular participants. 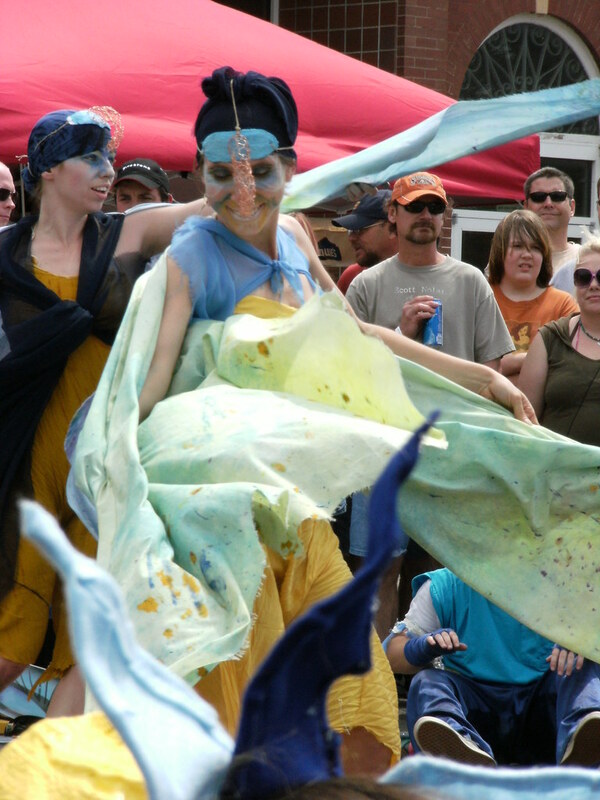 Performer Jennifer Robertson said she especially loves the opportunity to bring art onto the streets. Spallone said the circus helps to bring together the talents of Norman, whether costume-makers, musicians, or performers. All of the PFC’s costumes are hand-made with recycled art props. They will be at Tribal Revival on May 23 and Dfest in Tulsa on July 24-25. Thanks Gene & PFC-ers! collaboration,community,creativity, energy, expressive movement,people,recycling,YES and free in the streets of Norman and beyond. Yeah y’all! and THANKS!